There’s a new food blog in town: a work in progress. A delighfully personal and attractive one, I might add. Strawberries are back in the fruit shops here in Sydney, though they are coming all the way down from Queensland. I have tasted some very delicious and fragrant specimens. So here’s a recipe to celebrate strawberries. Before you speculate too much on the meaning of today’s posting, you should know that Bent on Food is in fact the name of a cookery school on the New South Wales Mid North Coast. The unique name originates from the fact that the school is in fact situated on Bent Street. Well, actually it isn’t, but Bent Street is nearby. Confusing. 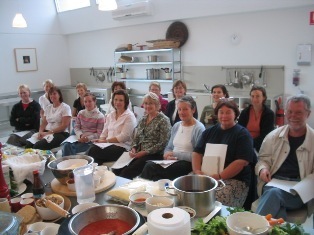 Anyway, I’ll be teaching there soon and if you live anywhere near Wingham NSW, don’t miss this once-a-year opportunity to come along for a delectable day of cookery and eating. Details and Bookings or phone 02 6557 0727. Homemade Yogurt Cheese (Labneh) with Balsamic and Honey-drenched Strawberries. If you ever need to find anything I have ever published about any subject, either on my blog or on my website, here’s two nifty ways of locating what you are looking for. If you are looking for anything on my blog, go to the SEARCH box in the top right corner of the blog home page and key in what you are looking for. You get my drift. Happy searching! Yesterday’s blog on chapatis elicited a lot of response and specifically the conversations segued into making breads without wheat flour. One lady asked about making a bread suitable to eat on the grain-fasting day called ekadasi, which falls every eleven days after the full moon and new moon. Though these details are in my archives, here’s the recipe again for buckwheat chapatis. By the way, they are very hard to roll out, having no gluten. Patience and a deft hand is required. Buckwheat is not technically a grain, but it lends itself to breads and pancakes as it behaves like a grain. 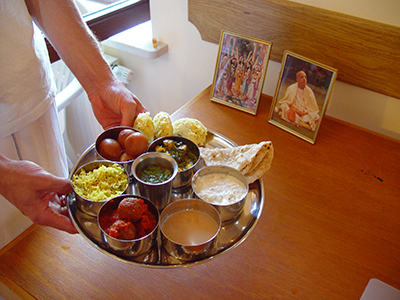 In India and elsewhere, on the grain-free Vaisnava fasting day of Ekadasi, buckwheat, as well as other pseudo-grains, like chestnut flour and tapioca flour, are used in a variety of versatile ways. If you like the taste of buckwheat, you’ll love these tender versions of India’s most popular flatbread, the chapati. Buckwheat contains no gluten, so those of you who can’t eat wheat will find this recipe appealing. As far as equipment is concerned, you’ll need at least one non-stick frypan, (two or three are better), a rolling pin, a smooth surface for rolling, and some kitchen tongs. Makes 10 large chapatis. melted butter or ghee (optional, for spreading over the chapatis after they’ve been cooked). Combine the buckwheat flour and salt in a large bowl. Boil the potatoes in sufficient water until they are very soft. Remove, drain and mash them. Measure the quantity of mashed potatoes. You will need 1 cup. Place the measured quantity of mashed potatoes in a large metal sieve over a large kitchen bowl. Push and rub the potato through the sieve and collect it in the bowl. Pre-heat the large non-stick frying pan, or pans over moderate heat. Combine the warm mashed potato with the buckwheat flour. Add the water a little at a time to form a soft, but not sticky dough. 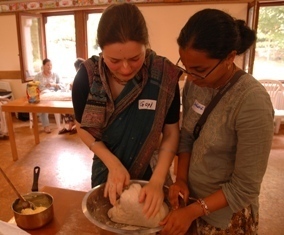 Turn the dough onto a clean, smooth working surface, sprinkled with buckwheat flour. Turn and knead the dough for one or two minutes. Pinch off 10 even-sized lumps of dough and form them into smooth balls, pressing and kneading them gently into thick patties. Dredge a patty of dough in flour and place it on the flour-strewn surface. Carefully roll it with a dry, flour-sprinkled rolling pin to a fairly thin, even, smooth disc about 15 cm (6 inches) in diameter. If it sticks to the pin, re-roll it and apply more flour. A little care needs to be taken here since the dough contains no gluten and is very delicate. Very carefully pick up the disc of dough and quickly transfer it to the frying pan. Slip it onto the hot pan, taking care to avoid wrinkling it. Cook it for about 1 minute on the first side. The top of the bread should start to show small bubbles, or it may even fully puff up in the pan – even better! Turn it over, being careful not to tear it, and cook it on the reverse side. 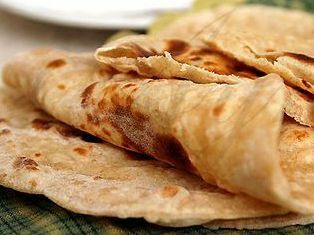 When a few dark spots appear on the underside, lift the chapati with kitchen tongs to about 5cm over a full flame, if you are using gas. If using an electric stove, you’ll need to sit a cake cooling rack above, but not touching, the element. The chapati should swell into a puffy balloon. Cook it until it shows a few more darker spots, then place it in a bowl or basket covered with a clean cloth, and continue cooking the rest of the chapatis. When they are cooked and stacked, you may like to butter them. Serve buckwheat chapatis hot, or keep them warm, well covered, in a pre-heated warm oven for up to half an hour. Here’s a archived blog from 2008, before the Hare Krishna Temple in Christchurch was severely damaged in February’s earthquake. “Dear Kurma I was at the temple the other day and the samosas were amazing. Rebecca Kravitz from New York City wrote: “Hiya Kurma, do you have a recipe for something nice to do with eggplants? I have a whole box full and I am running out of ideas”. This tender and delicious pickle from Maharastra is simultaneously hot, salty, sweet and sour. Select firm, fresh eggplants for best results. You may wish to replace the cayenne with ground chilies of any variety, or with a chili paste such as sambal oelek, in which case the chili should be added towards the end alongside the sugar. Makes 3 cups. 2 teaspoons dry-roasted and ground cumin seeds. I found these images of my 2003 South American tour and thought I’d share them with you. Cooking tomato chutney at a class conducted at Gopala Prasada Restaurant, Rua Antonio Carlos, São Paulo, Brazil. We splashed the camera with milk. Here we are at Nova Gokula Farm Community, Pindamonhangaba, São Paulo State, SP, Brazil. A beautiful, picturesque retreat ouside of São Paulo city. This is one day of a jam-packed multi-day course at the Hare Krishna Cultural Centre, at J.M Calle, Santiago de Chile. 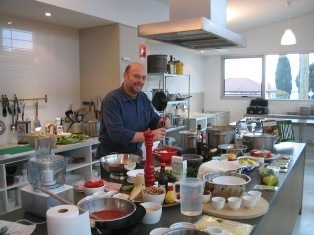 And finally here cooking Gulab Jamuns at a class in the prestigious Instituto Argentino de Gastronomia, Avenida Santa Fé, Buenos Aires, Argentina. If you want to read the complete South American story, click here.